Length 8.5 Km (i.e. fully sealed). Expectation that at $5 million per annum there will be enough budget. I am still communicating with the powers to be on why they are not allocating more of our money on road sealing. Shane Ellison the CEO of AT has admitted that is has been diverted into higher priority projects like the City Rail Link. AT reduced what seemed like a $12.1 million allocation (the Mayor announced $121 million over 10 years) to $4.7 million this year and $5 million next year. It appears that AT are “uncontrolled” and are to blame for the lack of road sealing progress. Either the Mayor and Auckland Council have lost control of AT or they are both in cohorts misleading the Rodney Rural public. Unfortunately, unless we do something about it, our side roads will not be sealed within our lifetime, but downtown Auckland will be fabulous! Think about it every time you fill up with gas with the RFT or paying the new Local Target Transport Rate. Us rural people are being screwed by Auckland Council and Auckland Transport. I will give a more informed update shortly. p.s. Only 8.7 Km of new seal since 9 years in Super City. 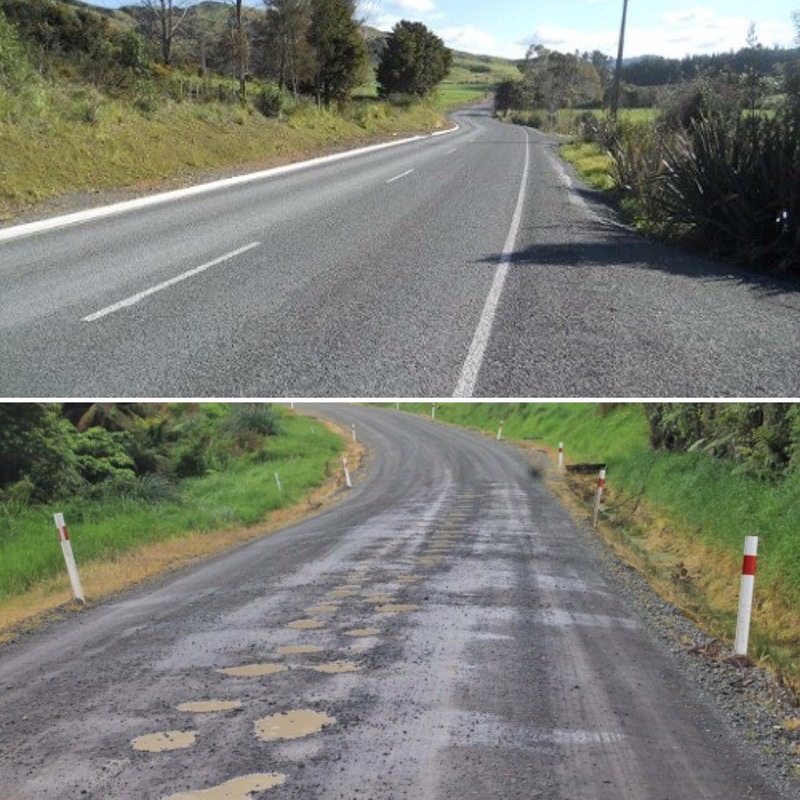 Ahuroa – Road sealing budget update – Important news. I was very confused over the recent Auckland Council (AC) and Rodney Local Board (RLB) announcements with regards sealing our metal roads and have spent the last month investigating and emailing the powers to be. Araparera Forestry Trust fund – For those new, this is an old northern Rodney target rate that was paid into a pine forest venture with the idea that profits would be spent on sealing the roads. After much investigation by Greg Sayers and Colin Smith they have found $2.8 million that is available and the RLB have selected some minor roads from the priority list to be sealed. Local Transport Target Rate – This is the $150.00 on your rates. When consulted with the public this included $13.5 million to be spent on road sealing over ten years. At the last minute the Local Board altered the funding statement and excluded road sealing and essentially only benefitting the urban town centres with bus services, footpaths and park n rides. The rural community were ignored. This was passed by vote 6 to 3. Our local members Beth Houlbrooke and Tessa Berger voted yes. Regional Fuel Tax – This is the extra 11.5 cents per litre for gas. The Mayor Phil Goff made the announcement that $121 million would be spent on road sealing over the next decade. That was made up of $36 million from General rates and $85 million from the RFT. However, it is Auckland Transport (AT) that budget the year on year allocation and have allocated only $3.1m + $1.6m = $4.7m for 2018/19 and only slightly more for 2019/20. The bulk of the amount is “promised” in the later 4 years. Apparently, there are “other” higher priority projects in the Super City. Rural Rodney has been badly treated. Greg Sayers has been very active on our behalf as have Local Board members Colin Smith, Alison Roe and Brenda Steele. The rest of the Local Board are working against us. As for Ahuroa Road sealing; it is 2nd on the priority list and is being designed for full length sealing. Unfortunately, there will not be enough funds for at least two years to begin the project. As for the other Ahuroa roads it will be more than a lifetime wait? Since we have been in the Super City (9 years), AC / AT have only sealed 9 kilometres. Other Rodney rural communities are also upset, and I expect a collective reaction against AC / AT is eminent. This is an abridged version of conversations and emails, contact me if you want to know more. Ahuroa Rd – Sealing update from Glen Ashton. Hello, we have received the attached (linked) update from Glen Ashton which outlines his latest news and information on his ongoing dealings with the Auckland Council and AT over his concerns and actions to try to get Ahuroa Rd sealed as quickly as possible. Please click on this link to view his update.